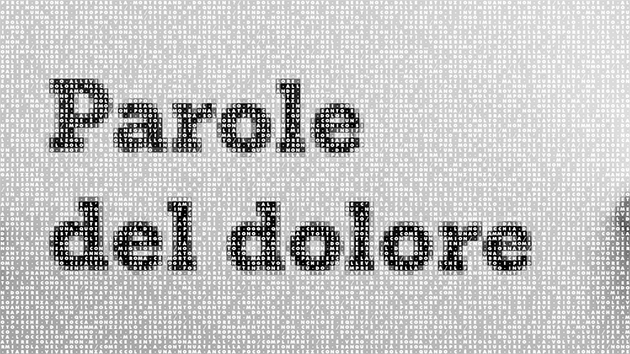 Parole del dolore (Pain words) is a project by Vivere senza dolore Onlus: in March 2013, in Rome, citizens and patients who suffer from chronic pain were asked to tell their stories and feelings. 141 testimonies collected during the two days initiative are presented within an interactive installation. “Drop a word in the ocean of meaning and concentric ripples form. To define a single word means to try to catch those ripples. No one’s hands are fast enough. Now drop two or three words in at once. Interference patterns form, reinforcing one another here and canceling each other there. To catch the meaning of the words is not to catch the ripples that they cause; it is to catch the interaction of those ripples. This is what it means to listen; this is what it means to read. It is incredibly complex, yet humans do it every day, and very often laugh and weep at the same time. To read is an incredibly complex process, yet humans do it every day … Writing, by comparison, seems altogether simple, at least until you try “ (Robert Bringhurst). The interactive installation Parole del dolore is a means of recognising the effort of those people who attempted to describe in words their personal experience of pain. The goal of the installation is to valorize the result of this process. All the sentences quoted are authentic and genuine, but they are not aphorisms to be framed like a painting. For this reason, they don’t appear alone on the screen but interlaced in a letter matrix. Sentences have been kept together because that’s how they express their full meaning. They get highlighted but are never isolated from the overall context. The simultaneous appearance of keywords and similar concepts emphasizes their collective condition. For this reason, the installation has a poetic, rather than statistical, nature. With the help of graphic effects that animate the throbbing of the letter matrix, it aims to recall the complex experience of pain suffering and the effort of describing it using the language and its solid form: writing. Those who take their time in front of the screen to read the text, will see themselves reflected in the color of the letters in the matrix, the first tangible effect of their willingness to share, in first person, someone else’s experience. Chronic pain is a sensory, cognitive and emotional experience, with an impact on people’s life, and on their relatives’, depending on the context and the psychological state of the person (Clark, 2004; Bushnell, 2013). In March 2013, during the V edition of Simpar, Vivere senza dolore asked people and patients to write their feelings and thoughts about chronic pain. The texts collected on the street and from the patients of the Chronic Pain Center of Tor Vergata Hospital of Rome, have been analyzed with qualitative methods, in order to verify the correspondence between the experience recounted by patients and the themes related to pain identified in the psychological literature. Two judges evaluated the texts, recognizing the prominent themes and estimating an index of agreement. The themes that emerged from patients’ words have been compared with the most relevant psychological factors and biopsychosocial implications. The comparison shows that the categories used both by patients and people suffering from chronic pain generally reflect those identified by scientific studies. These results confirm the need of a systematic and interdisciplinary approach (biomedical, psychological, social) in chronic pain therapy, capable of understanding patients’ suffering and giving efficient answers to guarantee a good quality of life. Vivere senza dolore has decided to transform Parole del dolore into a complete interdisciplinary research project. Psychologists, semioticians, linguists and service designers, coming from both university and enterprises, will be involved in the project. They will collaborate actively, with innovative tools and scientific method, to describe the complexity of chronic pain discourse. The purpose is to create a shared pain language that works as a bridge between those who suffer and those who are in charge of helping them. Researchers will work on creating a corpus of texts about chronic pain, part of them coming from digital media, part coming from a selected community of: patients, non-patients, doctors and professionals involved in pain therapy. The collected materials will be analyzed both with a semio-linguistic and psychological approach. iii. design strategies and services in order to improve the interaction between doctors and patients with chronic pain, and to make more efficient tools for the evaluation of patient’s quality of life. Founded in April 2010 by a group of volunteers active in promoting initiatives to support patients with chronic pain, the Association Vivere senza dolore (Live without pain) is the first international association founded by patients for patients living with unnecessary pain every day (over 16 million people, only in Italy) and who often feel alone and abandoned in their daily struggle. Vivere senza dolore represents the point of reference for people suffering from chronic pain. It promotes initiatives aimed at patients, physicians, institutions and professionals with the aim, not only to remain vigilant against pain disease, but also to monitor how the pain is actually treated and what are the needs of patients and physicians, to ensure the millions of patients a life worth living. Would you like us to keep you updated on the "Parole del dolore" project?